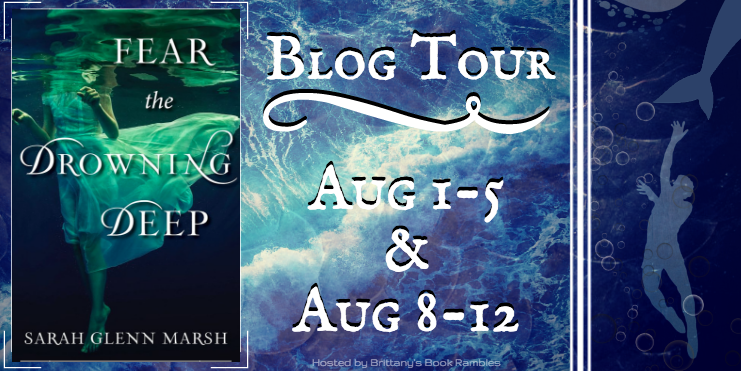 Brittany's Book Rambles: Fear the Drowning Deep by Sarah Glenn Marsh Blog Tour! 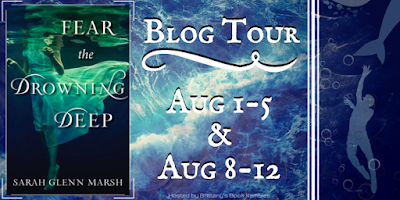 Fear the Drowning Deep by Sarah Glenn Marsh Blog Tour! I knew going into this book that it was going to be masterful, and I was not disappointed! 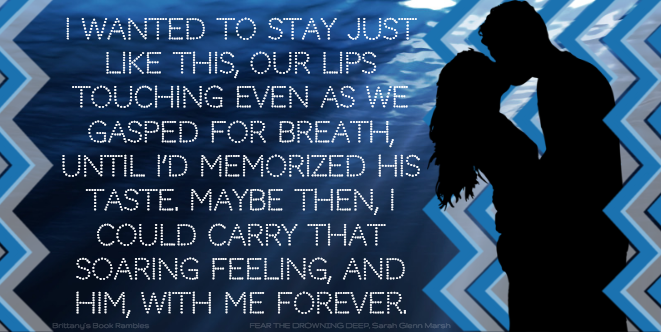 Fear the Drowning Deep is like nothing I've ever read before. Sarah's writing is hauntingly beautiful in this enchanting and treacherous tale. 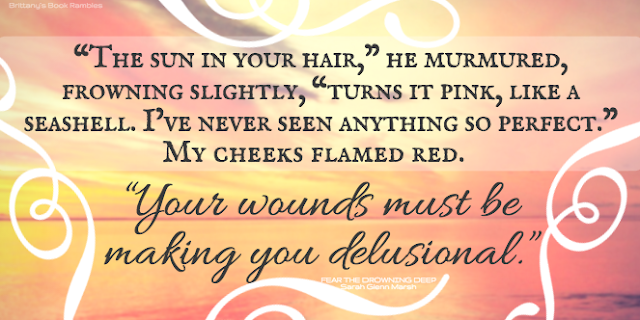 The characters are wonderful, the plot is well-executed, the writing is gorgeous—I mean, what more could you ask for? 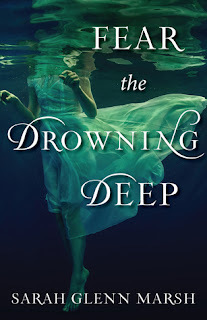 Fear the Drowning Deep brings to life a culturally rich setting that I've never read about; I truly loved reading and learning about the Isle of Man! Sarah seamlessly weaves it into the story in such an enthralling way—I simply couldn't get enough of it! For me, Sarah is an auto-buy author, and trust me, my auto-buy list is tiny. In short? Do yourself a favor, and read this book! 1) I am a huge fan of Sarah's writing! Her prose is so incredibly melodic and passionate that I could easily get lost in her words, and never want to be found. Whenever I read her work, it yanks at my heart-strings, and I become a messy ball of emotions. 2) For as long as I can remember, I have been fascinated by the sea and everything undiscovered and mysterious within its depths. 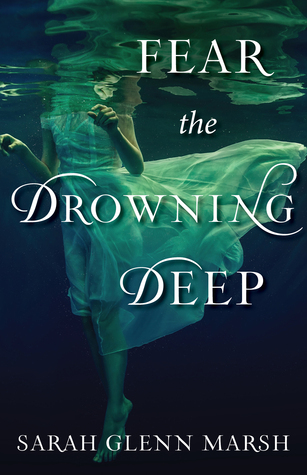 In Fear The Drowning Deep, the ocean is almost it's own character because of how big a role it plays in the daily lives of the people in the book, as well as all of it's fishy, mystical, and creepy inhabitants. 3) The rich setting in this book was a joy to discover. The story takes place on the Isle of Man, which I have never heard of before, but now I want to learn even more about it! The culture, language, and history of this tiny island in the Irish Sea between England and Ireland all sound extremely interesting. Most importantly, Sarah really brought those aspects to life, all while weaving in her fantastical twists. 5) I looooove the family dynamics in this book. It's so rare in YA to find a family with both parents alive, and a generally happy home life; it brought warmth to my heart to finally read a book like this. I love Bridey's entire family, from her quirky parents to her endearing sisters. They made me want to propel myself into the book to compliment them all on what a wonderful family they were. 6) The ending of this book will have your heart racing and pumping with so much adrenaline. I could not contain myself as I was tearing through the last section. I don't want to spoil anything, but be prepared to feel like you want to jump out of your skin. * You Brought Me Up by Méav- this song sets the tone for the book! *Full Fathom Five by Méav - this is a Shakespeare sonnet-turned-song with an eerie, siren-like quality that reminds me of the forbidding ocean. 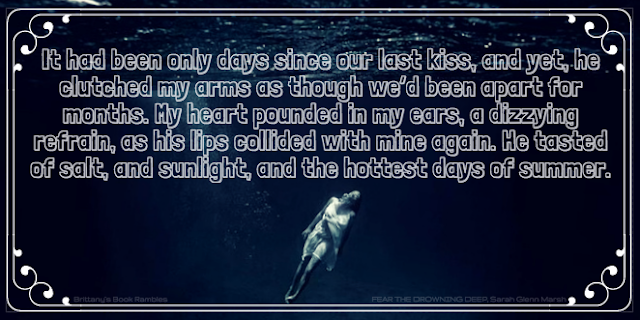 *Wild Child by Cardiknox - a song for Bridey, and possibly Grayse and Mally as well! *King of Anything by Sarah Bareilles - a song that describes how Bridey feels about certain people in her town! I always love listening to author's playlists for the books, and then going back through the book and playing the music along with it. It's awesome! I really hope you check out Fear the Drowning Deep!